If there's one thing Hourglass does amazingly well, it's take a category - say, in this instance, Blush - and create something altogether unique and flattering. The Hourglass Ambient Lighting Blush Palette will be any beauty lover's dream gift this year. 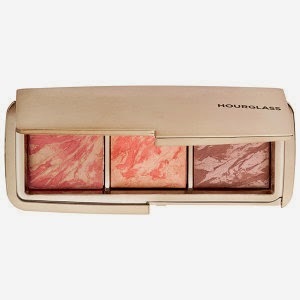 These are not just blushes with various shades baked inside - Hourglass has fused Ambient Lighting Powder, its cutting-edge collection of finishing powders, with an array of vivid cheek colors. The result are three shades that are not only versatile and work well together, but can also work on all skin tones (as either straight blush or a highlighter for those with very deep skin tones). The three shades in Hourglass Ambient Lighting Blush Palette (shown,above) are Luminous Flush (champagne rose) (l), Incandescent Electra (cool peach)(c), Mood Exposure (soft plum)(r). Out of the three, Mood Exposure is the one that will show up with enough pigment on all skin tones, and is actually one of the prettiest shades Hourglass has created. It is a bit pinker on the skin than true plum and makes skin look healthy and finished - but also quite natural. Like the Hourglass Ambient Lighting Palette, the textures of the Hourglass Ambient Lighting Blush Palette are also creamy smooth, super-finely milled and blend like a dream. The effect is color PLUS, beautiful, "lit from within" glow effect on the skin. There's no glitter, but the finely milled shimmer/mica is part of what gives the illuminating effect as well. Having the three shades are fantastic for travel as you can get many different looks out of them, and the palette and slim enough to toss into a regular purse or cosmetic bag. If you're thinking of treating yourself, keep in mind this is a great buy from since a single blush from Hourglass is $35 for .15 oz of product, and this palette has .11oz of each blush for less than double the price of two single blushes.